This was the band's first venture into sunny Shropshire. Chris was "globe-trotting" this weekend having just returned from a wedding in Scotland where apparently he got totally blotto! Still he arrived back on Sunday afternoon ready to make the trip down to Oswestry. First impressions were "small". Beautiful-looking tudor-type venue frontage &.... well, yes, small! Low ceilings, the main part of the pub was like a collection of cottage front rooms & felt just as welcoming/inviting. Built around 1560 - this is not a history lesson by the way or a study of English architecture but this place was cool. The owner John & barman Steve made us very welcome & entertained us with various stories about the Fox. The Fox has one main "secret". You pop down a little alley at the side & there opens up a courtyard at the rear with a cracking little stage undercover with "proper" electrics - no dodgy extensions etc here. Next to that is a little snug/smoking area where Lynne camped out with all her merch. 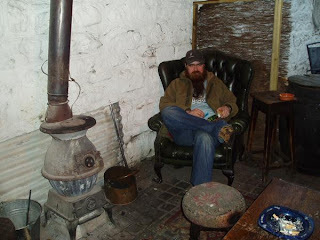 Both Martin (drummer) & Luke (FUK crew) looked at home in there with nice armchairs & a little wood-burning stove - you want to go there now don't you? In fact Adam (Reaperman) & girlfriend Sadie (FUK crew) looked so at home we thought they'd moved in. Along from the snug was a canopy for the audience to stand under if the weather turned a bit & in the corner of that area was a bloody great gas BBQ which sparked up about half-ten to serve up some awesome burgers/hot dogs/potatoes etc.... you still want to go there now don't you? After soundcheck was complete, our host handed us an array of acoustic instruments - acoustic guitar for Chris, acoustic bass for Adam, bongos for Martin & even Crazy Mike (FUK crew) joined us on a nylon-strung acoustic. Here was the band's chance to limber up with a little impromptu unplugged session in one of the afore-mentioned cottage front rooms, in front of the fire.... you still want to... ok, ok, I know you get the picture! We started the proper set on stage playing to a small number in the audience, feeling good but a bit quiet then the guys/gals out there hit the phones & our reputation in Oswestry took a leap. Thank you all those who phoned their mates & said "get down here now". In fact our host told us everyone would soon arrive & they did - book them & they will come! So, soon after we had a good crowd, great response & the set went excellently. And even Chris managed NOT to fall down the 3 steps in front of the stage. As we do nowadays the set we played majored on material from the Face of Adversity album & the Salvation single/EP. Plus, as we were playing a long set this night, we ventured in with a nice choice of covers like Heaven & Hell, Highway Star, Holy Diver & everyone seemed more than a little merry. By the way the beer was ace. A CAMRA real ale pub which lived up to its' reputation. The Stonehouse was awesome... you still want to etc etc. After the two sets we then whiled away a happy hour or two drinking & talking our usual beery shite, getting to know a few of the excellent regulars. Big thanks to our hosts John & Amanda, plus Steve & other staff. Big thanx to everyone who supported us at this gig & also bought some nice CDs & T-shirts off us - keeps us off the streets...maybe!? There's some nice photos from the gig (including the best armchair & wood-burning stove) loaded up on MySpace already so why not take a look? Our next stop is the bikers' paradise known as the Bike & Hound (Hyde, Cheshire) this Saturday 31st May for more Fury UK rock & madness. Hope to CYA soon! Powerplay magazine, issue no. 98, includes a review of the Monsters Of Mosh gig, at Jilly's Rock World, 16th March '08. 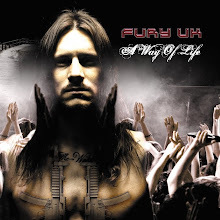 (Breed 77, Blaze Bayley, Tokyo Dragons, Fury UK & more). We picked up our copy of Powerplay magazine at WH Smiths but it can also be ordered online at http://www.powerplaymagazine.co.uk/ . 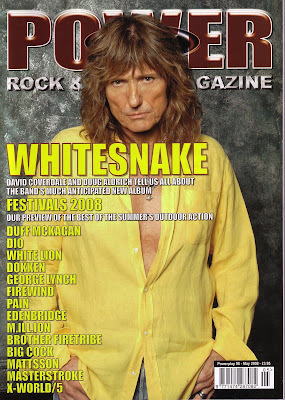 This current issue also features Whitesnake, Duff McKagan, Dio, White Lion, Dokken, George Lynch, Nightwish, Firewind & many more. Hey, it's Chris. I'm pleased to announce that my relationship with Gibson Guitars is now official. I now have an endorsement/artist deal with Gibson guitars as well as my existing arrangement with ENGL amps. Last week we went to the Total Rock Radio studios in London for a live interview. Then later on travelled to the Gibson offices to pick up my new SG Standard! What a good day! Cheers for the guys at Gibson! We can now breathe a sigh of relief at the news that the 2008 Bulldog Bash bikers' festival is to go ahead. The event - Europe's biggest of its' kind - had been under threat due to police concerns that tension between rival motorbike gangs would be a danger to the public. As most people are aware the situation arose following the murder of biker Gerry Tobin last year whilst he travelled home from the Bulldog Bash but thankfully after reassurances from the organisers of the event & the implementation of special powers for security, the festival is set to go ahead this year at the Shakespeare County Raceway in Warwickshire. The four-day festival is a family event and in 21 years there have never been any serious incidents. 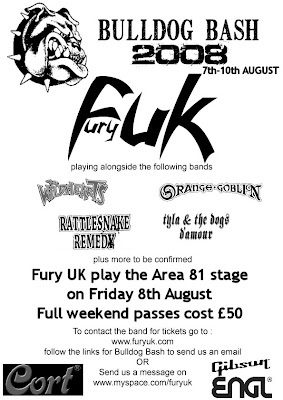 Earlier this year we were the first band confirmed to play the 2008 festival, alongside great bands such as The Wildhearts & Orange Goblin. It was an honour when we were confirmed to play but then when the doubts came up about the licence for the event to go ahead we really thought we'd lost the opportunity. We're all unbelievably relieved at the news that the organiser's appeal has been successful & now we plan to make the most of it. We've always enjoyed a fantastic relationship with the biker community. The Bulldog Bash runs for 4 days beginning Thursday 7th August & we play on Day 2. Tickets are available now online at http://www.bulldogbash.com or direct from the band at http://www.furyuk.com , or just message us here at myspace. Well, we were well-pleased to be invited down to London into Total Rock Radio to do an interview. We ended up being there for well over an hour which was pretty awesome - saw it through to the end of the show . DJ Catbird is a cool guy , excellent to talk to & we covered all sorts from the history of the band, line-up changes, the CDs, previous gigs, upcoming gigs, plans for the next album. Our label was there with us too & was able to mention some of the other bands on the roster, such as Core Of Nation, Toxic, Breakdown, Smith 6079 & more. Other important topics covered were real ale & curry. Catbird dragged(?) us off to the pub after that! LOL. Many many thanks to Catbird, we had a great time & was a pleasure to be sat in the same seats as some previous interviewees e.g. Glenn Hughes, Chad Smith et al. After leaving the pub we were off to the London offices of Gibson Guitars to collect Chris' new Gibson SG Standard guitar, in black. Now those of you who know Chris will understand his excitement - Chris, already a Gibson-user, is something of a gear-addict! Big thanks to Gibson for this guitar which is part of the artist deal they arranged for Chris. This guitar will be a mainstay of Chris' playing for years to come. We then made our merry way back up to sunny Manchester - yes, it really IS sunny at the moment , believe it or not! Chalk that one up as a good day at the office! Live4metal have been good enough to do an interview with Chris Appleton.... "that dark shadow called the music industry"....? Butchers Arms/Thatched House Gigs: A Review! Once again, the bass playing ReaperMan is here to recap and review the weekends gig schedule that has come to pass. So... 'ere we go! 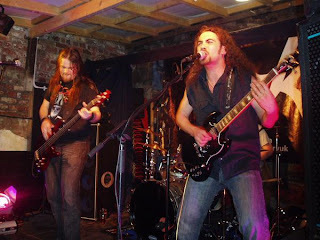 Friday night saw us returning to a favourite venue of Fury UK's: The Butchers Arms in Bolton. Rather than being in the smaller room of the venue, we ended up in the larger room (where we had a killer New Years Eve show), which meant no rickety Fire Escape stairs to negotiate. Plenty of supporters from the crew, the Scavengers, and the general public. The gig itself was immense and as always the Scavengers and the people there were very supportive and appreciative of the music we played, which included some Face Of Adversity classics like “Wicked Glass” and “The End” (of which hadn't been in the Fury UK set since a few weeks ago), and new covers from the school of Motorhead: “Killed By Death”, and our own take on their song “Hellraiser”. A funny, but nearly serious event, at the Butchers came in the form of Chris, tripping over whilst checking sound levels with Mark, and nearly falling either into the speaker cabinets, or Gibson SG first onto the floor. However, Chris is like a cat: He will always land on his feet.... or someone elses. Sunday night, and it's Charity Night. 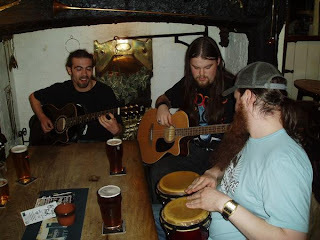 We were playing at the Thatched House in Stockport, a house of rock, metal, and rather nice ales (hee hee). The gig was for the Rainbow Family Trust, and there were pleanty of bands on for the day, including Breakdown, Rogue Frequency, and many others! Chris and Martin getting to the venue for 1pm, with pleanty of drinking on hand (I suppose), with Captain Forté arriving later on at 7pm. We were on for an hour, being the headlining band. Such an amazing set, but a very bloody warm one! 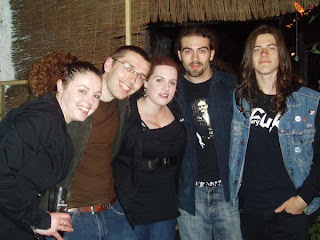 Was so hot, you could've probably fried an egg on top of Chris' ENGL (but of course, that isn't advised). Lovely people there too, really supporting a good cause and rocking out as always. Big thanks to everyone who set up the Thatched House gig, as well as Mad Ian and Josi for coming down to the gigs, Peeeete, the usual suspects from the Fury UK Crew, the Scavengers for having us back, and all the new fans of Fury UK! We hope to see you again very soon. This is Captain Forté signing off!